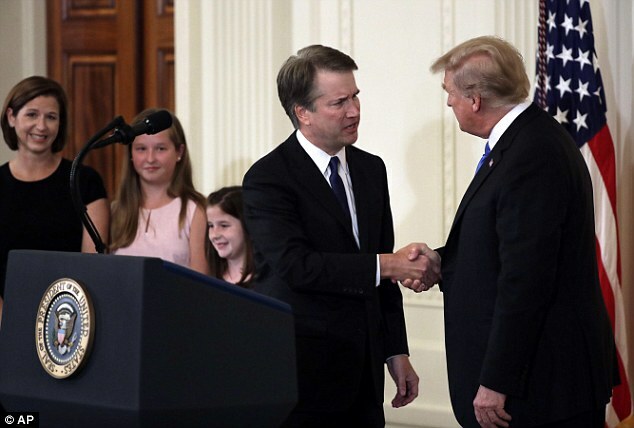 President Donald Trump named Washington, D.C. federal judge Brett Kavanaugh on Monday to fill a vacancy on the U.S. Supreme Court. 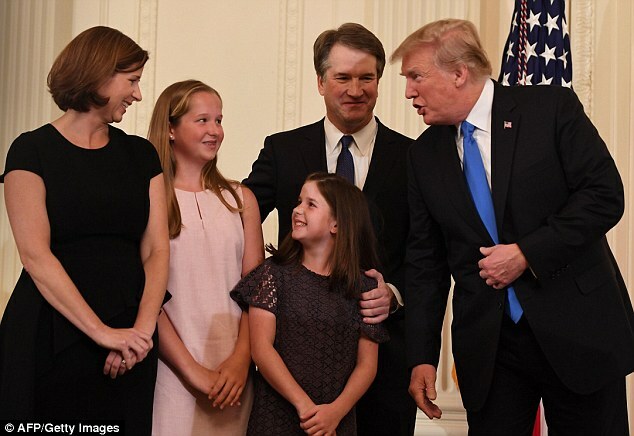 'Judge Kavanaugh has impeccable credentials, unsurpassed qualifications and a proven commitment to equal justice under the law,' Trump said in his announcement. 'There is no one in America more qualified for this position, and no one more deserving,' the president added. He called Kavanaugh 'one of the sharpest legal minds of our time' and urged the Senate to confirm his pick quickly. 'This incredibly qualified nominee deserves a swift confirmation and robust bipartisan support,' Trump said. The announcement was a family affair. 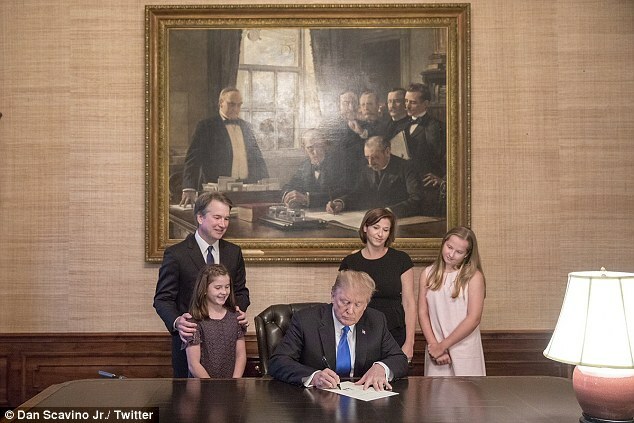 Kavanaugh was joined by his wife Ashley, and daughters Margaret and Liza. His parents were at the White House, seated in the audience next to first lady Melania Trump. In his remarks, Kavanaugh touted his strong record with women throughout his career, noting he's hired a majority of female law clerks and that Elena Kagan, who is now on the Supreme Court, hired him to teach at Harvard. Kavanaugh also paid tribute to his parents, who were both lawyers. His remarks were filled with stories about his family and his appreciation of them. He noted both is daughters love sports and joked his young daughter Liza 'loves sports and she loves to talk.' He then gave her a high five. He and his wife met when they both worked at the Bush White House and their first date was September 10, 2001 - the night before the terrorist attacks. Kavanaugh's remarks were filled with light-hearted stories like the above, making the audience laugh and showing his all-American appeal that Trump was said to be looking for his pick. His talk was focused on the personable with little conversation on his judicial record. But he did make an appeal to the Senate that will confirm him. 'I will tell each Senator that I revere the constitution,' he said. 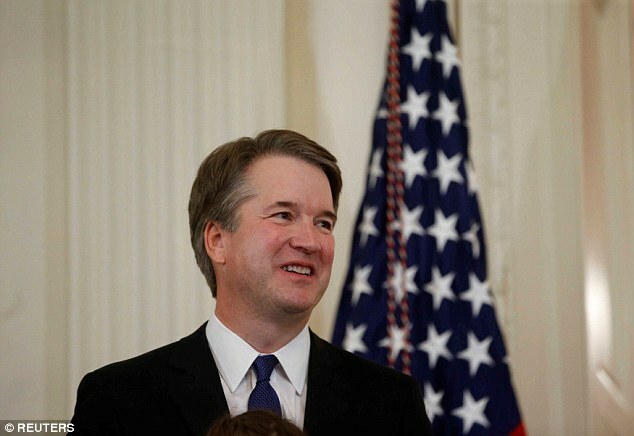 Kavanaugh was a front-runner for the nomination ever since Supreme Court Justice Anthony Kennedy announced his retirement on June 27. Trump, in his announcement, indicated he wanted a judge that followed his successful first Supreme Court nominee, Neil Gorsuch. The president noted Kavanaugh, like Gorsuch, clerked for Kennedy. Gorsuch and Kavanaugh also went to the same high school. Gorsuch's confirmation is considered one of the major successes of the Trump administration. 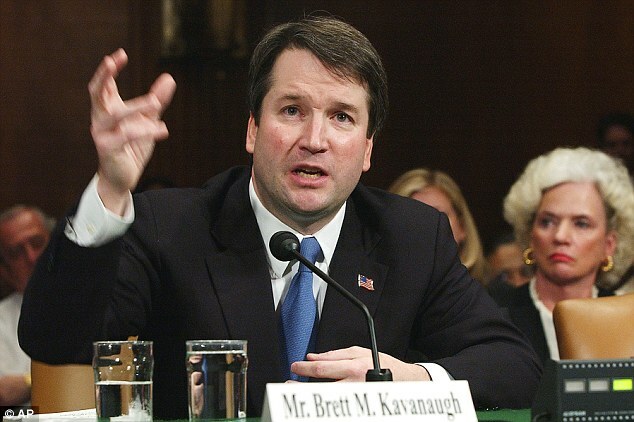 But Kavanaugh's long record – 12 years as a judge, nearly 300 written opinions, a multitude of scholarly articles, a paperwork trail from his time in the Bush White House, and thousands of documents from when he served on the Starr investigation – has raised concerns Democrats will have an embarrassment of riches to use in questions during confirmation hearings, leading to a lengthened process and a tough confirmation vote. 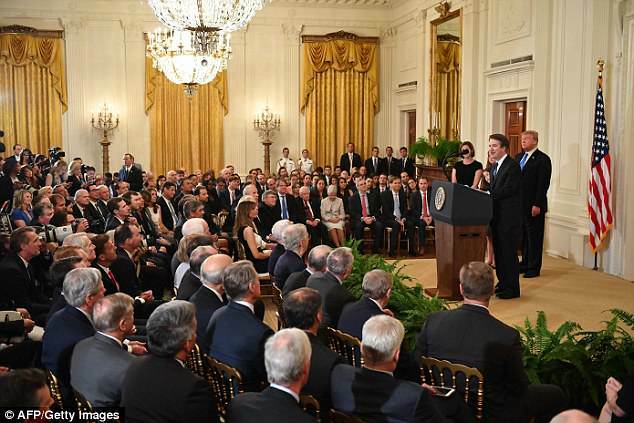 As he did with Gorsuch barely 10 days after taking office last year, the president introduced Kavanaugh to a packed East Room at the White House and challenged the U.S. Senate to confirm his nominee without delay. The Gorsuch nomination was seen as an even political swap for the deceased Justice Antonin Scalia, one rock-ribbed conservative for another. Replacing Kennedy, often seen as a 'swing vote' on tight 5-4 decisions with enormous societal implications, with a conservative nominee is a far weightier exercise. Reactions to Trump's decision reflected a nation - and its capital - as divided as ever. 'Let’s be clear: a vote for Kavanaugh would be a vote to rip health care from American families and deny women their constitutional right to make their own health care decisions,' DNC Chair Tom Perez claimed. Virginia Democratic Sen. Tim Kaine, who ran for vice president with Hillary Clinton in 2016, said he would judge Kavanaugh according to his views on preserving the Obamacare law, abortion rights and civil rights, and serving as a 'check' on Trump himself. Kaine also argued that there should be no final confirmation vote until after the November midterm elections. North Carolina Republican Sen. Thom Tillis, however, called Kavanaugh 'a mainstream and fair-minded jurist.' Oklahoma Republican Sen. James Inhofe praised him for 'respecting judicial restraint' on environmental regulations. South Dakota Republican Sen. John Thune's statement was a virtual shoulder shrug that seemed to acknowledge Democrats' plan to play the role of obstructionist. 'Senate Democrats have already made it clear that they intend to listen to the far left of their party and fight this nominee regardless of his credentials,' Thune said. Kavanaugh, 53, has strong ties to the D.C. area, where he was born and attended the Georgetown Preparatory School. Conservatives are fans of his work; he has strong ties to the Federalist Society, which helped compile Trump's list of potential nominees, and he was said to be the favorite of White House Counsel Don McGahn. 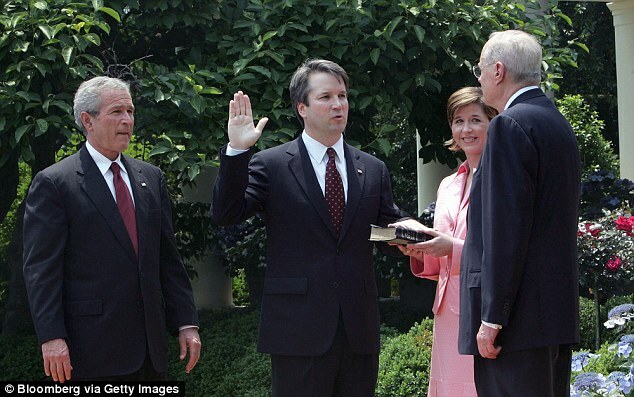 Kavanaugh's history includes time in George W. Bush's White House, where he served as staff secretary to the president. He also clerked for Justice Kennedy. And he played a lead role in drafting Independent Counsel Kenneth Starr's report following an investigation into President Bill Clinton. Kavanaugh also led the probe into the suicide of Clinton's Deputy White House Counsel Vincent Foster. Kavanaugh argued at the time that Clinton could be impeached for lying to his staff and misleading the public about his relationship with White House intern Monica Lewinsky. That could hurt Trump if the Supreme Court were ever asked to rule on the implications of Special Counsel Robert Mueller's Russia investigation. But Kavanaugh, who worked in the Bush White House after his time with Starr, later expressed misgivings about the toll investigations take on presidents. Some Republicans also have misgivings about Kavanaugh, stemming from his rejection of a pair of constitutional challenges to the Affordable Care Act, also known as Obamacare – the health insurance law Republicans tried to dismantle for years. In one dissenting opinion, he argued that the ACA's individual mandate could be considered a tax, opening the door for the rationale Chief Justice John Roberts used in a later Supreme Court decision sparing the law. A recent case before Kavanaugh that will likely come up in confirmation hearings combined the hot-button issues of abortion and illegal immigration. A pregnant teen in immigration custody wanted to obtain an abortion, but her government guardians said no. Kavanaugh dissented from the opinion of the D.C. 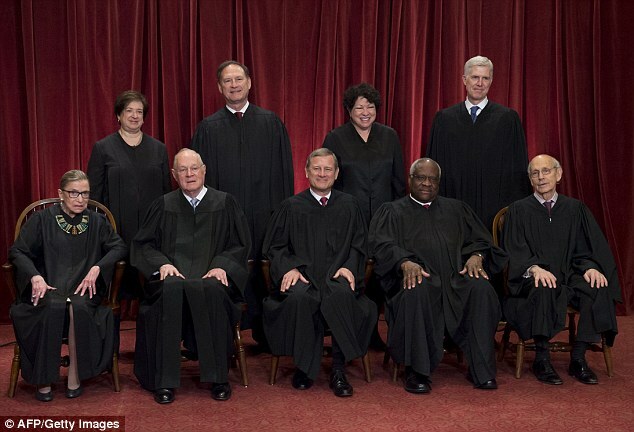 Circuit's full bench to permit the teen to receive the abortion. Some conservative critics say his opinion in that case was too cautious and showed too great a willingness to compromise in the face of controversy. But Kavanaugh's legal history of opinions include several dissents that were later vindicated by Supreme Court majority opinions. Kavanaugh sits on United States Circuit Judge of the United States Court of Appeals for the District of Columbia Circuit, a spot for which Bush nominated him in 2003. His confirmation hearings stalled for three years amid charges of partisanship. Kavanaugh was confirmed by a vote of 57-36. Like Gorsuch, Kavanaugh's name came from a list of 25 potential Supreme Court nominees that Trump has made public, a collection of candidates expected to be largely interchangeable on the key question of how to read the words in the U.S. Constitution. The list consists mostly of federal judges, and entirely of what conservatives call 'originalist' legal thinkers – those whose rulings are rooted in the believe that the Constitution must be interpreted according to the plain meaning of its text, and not logically expanded to reflect changing values and norms. As he barnstormed and blustered through the Republican primary field in 2016 and became considered the 'presumptive' Republican presidential nominee, Trump released a list of 11 potential jurists in a maneuver calculated to put conservatives at ease. That list nearly doubled in length by the time of his inauguration, and added five names just nine months ago. The Federalist Society and the Heritage Foundation, two right-wing groups, consulted with the White House on the list. Kavanaugh was not among the first 11 potential nominees Trump identified in May 2016, only appearing on the list last November. The final contenders for the spot to replace retiring Supreme Court Justice Anthony Kennedy were federal Judges Thomas Hardiman, Amy Coney Barrett, Raymond Kethledge, and Kavanaugh. 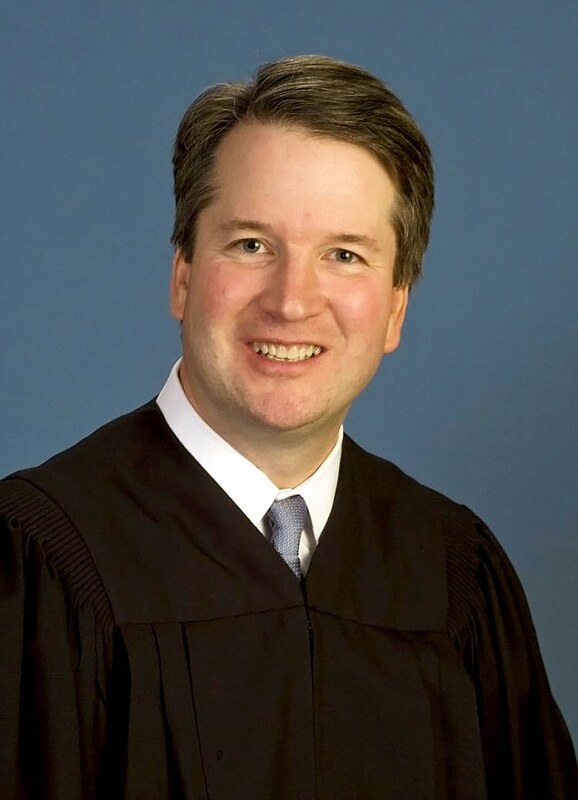 Kavanaugh will need 51 votes in the Senate to be confirmed. The GOP's 51-49 voting advantage is complicated by Arizona Sen. John McCain's absence. McCain, recovering from brain cancer surgery, hasn't been in the Senate all year. The resulting razor-thin margin leaves no room for error. Senate Republican Leader Mitch McConnell had become concerned that Barrett's orthodox Catholicism would alienate either Maine Sen. Susan Collins or Alaska Sen. Lisa Murkowski – or both. The two moderate Republicans have spoken positively of the 45-year-old Roe v. Wade abortion decision. That landmark Supreme Court case has weighed heavy on the West Wing in recent days, with Trump threading a right-to-life needle – resisting the urge to publicly call for the case's reversal while also avoiding giving Democrats a reason to turn abortion rights into an existential rallying cry. Senate Minority Leader Chuck Schumer drew blood Monday morning on the Senate Floor, insisting that any nominee must pledge adherence to the Roe decision as 'settled law' and 'share their personal views' about abortion. ignoring past nominees' customary silence on hypothetical questions about how they might rule in future cases. McConnell fired back, predicting a mudslinging battle for the ages and pointing fingers of blame at Democrats no matter who Trump should nominate. 'We don't know who he will name, but we already know exactly what unfair tactics the nominee will face,' McConnell said. By Monday morning some liberal pressure groups had already announced plans to rally in opposition to an as-yet-unnamed nominee. Louisiana Republican Sen. John Kennedy of Louisiana told the Associated Press that he's bracing for a brutal confirmation battle centered on the abortion issue. Kavanaugh will spend the coming days meeting with senators at their offices, sitting for a variety of get-to-know-you sessions and gauging support levels ahead of confirmation hearings. Former Arizona GOP Sen. John Kyl will serve as his 'sherpa,' the White House said Monday, steering him through unfamiliar and sometimes shark-infested waters. Kyl was the number-two leadership Republican in the Senate when he retired in 2013, and a veteran of the Judiciary Committee. McConnell was also said to have doubts that Kavanaugh could get confirmed. Kavanaugh has a long judicial history for both Republicans and Democrats to pick through during the hours of Judiciary Committee hearings that will dominate cable news in the weeks to come. He has written nearly 300 opinions in 12 years as a judge along with a plethora of legal articles. There are thousands of files and emails from his time in the Bush White House plus the 20,000 pages of material he compiled while working on the Starr investigation. It's common for a major nomination to trigger a paperwork avalanche. Last year, the Justice Department sent the Senate more than 144,000 pages of records relating to Gorsuch's time in the agency, according to Politico. Kavanaugh's long and controversial history could give Democrats an opportunity to delay the confirmation vote into October, when the Supreme Court's new term begins and when the midterm election is looming ahead. Vote counters will be watching moderate Republican Sens. Susan Collins and Lisa Murkowski. Also being watched are three red-state Democrats up for reelection this year were yes votes on Gorsuch, Trump's last Supreme Court nominee. Joe Manchin of West Virginia, Joe Donnelly of Indiana and Heidi Heitkamp of North Dakota met with Trump in late June to talk about the court pick. However, all three were invited to the White House for Monday night's announcement and none of them attended. Kavanaugh's strong ties to the Bush family were also said to cause doubts in Trump's mind. An example is a photograph of Kavanaugh that is circulating online and in the media. In it, Kavanaugh is being sworn to the United States Court of Appeals for the D.C. Circuit by Justice Anthony Kennedy, while his wife, Ashley, dressed in a pale pink suit and pearls, holds the Bible. 'It looks all-American,' a source told Politico of the picture.